A collapsible housing system having a floor panel, a first and a second side wall panel removably attached to the floor panel and extend upwardly, a front and a back wall panel removably attached to the floor panel and extend upwardly from the floor panel, a door in the front wall panel, a triangular first upper corner panel removably attached to a top edge of the front wall panel, and a second triangular upper corner panel removably attached to a top edge of the back wall panel, roof panels removably attached to the upper corner panels and extend over the side wall panels, and a window in the side wall panels, a door window in the door, and a window in the back wall panel, wherein the panels form an enclosure and the panels are attached via a hinge mechanism. Standard size is 4'w x 6'l x 7'h deer/duck blind that can be quickly assembled and disassembled and moved in a matter of minutes. Has been erected and ready for use by 2 10 yr old boys in 10 minutes. Compactly stores in space next to garage wall 4' x 6' x 10"
can also be used in backyard as playhouse. Hunters that need to move locations quickly and want to hunt in a warm dry blind for long stays on the hunt love this blind.If the animal patterns change, you change locations quickly and without equipment. If the lease or land is lost, hunter can pack up and move 10 stands in a day with a pick up truck. If the kids get bored with the playhouse in the back yard and dad is tired of mowing around it simply pack it up and store it, or dad can take the play house to the woods or lake to hunt when the season comes in. I am a hunter and I designed and built this blind to accomodate all the needs hunters have with other blinds. Duck hunters have the option to totally remove top half of roof and side panel for wing shooting or rig both to open quickly and easily when birds apporoach. We have built 12 and sold 5. The other 7 are still in service on our deer lease. We have multiple photos of stands and hunts available upon request from serious manufactuers. 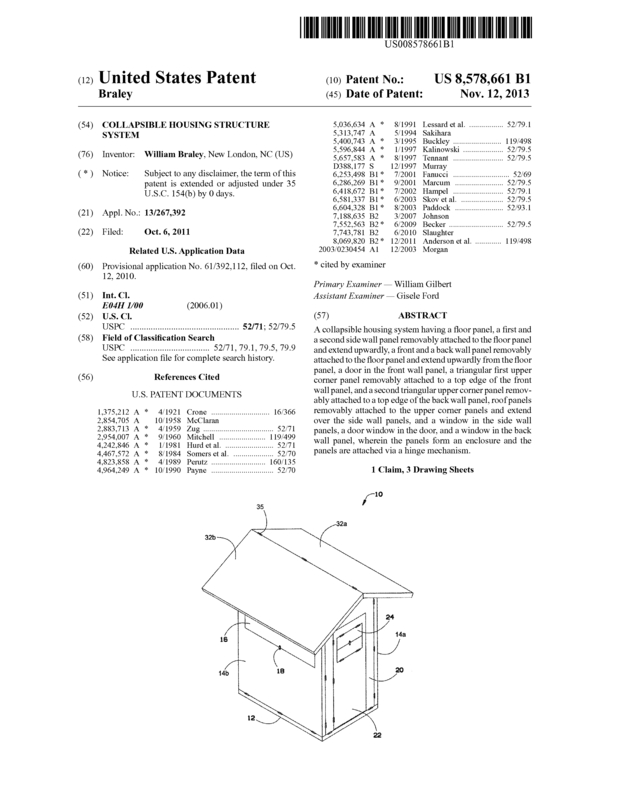 Page created at 2019-04-23 6:47:02, Patent Auction Time.